Classic looks with a contemporary twist, this is a large imposing bird table which is better suited ..
A recently designed bird table which arrives in kit form with stand. 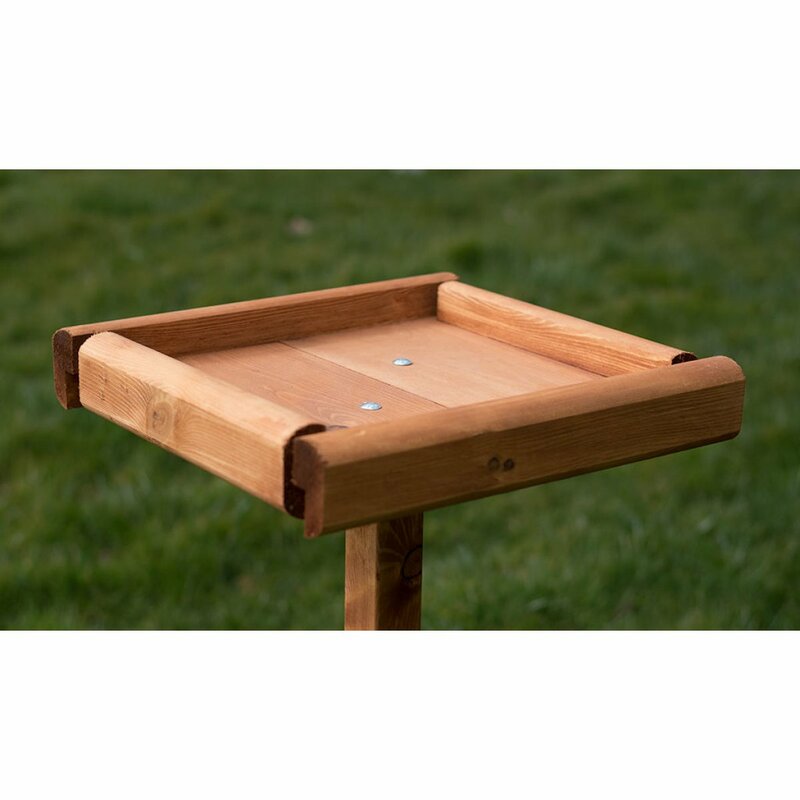 It fits in with any garden setting and is particulary good for smaller gardens and for customers who are new to bird feeding, or those that require a simpler feeding table or perhaps a secondary one for a smaller area of the garden. We've still put the same care and attention into this table as we have the others, and the build quality is second to none. I have ordered through Amazon and through yourself direct many times last year , i am interested in the open bird table i ordered one last year, i need another one but smaller the large one is too big for me this time. Is it possible for you to make me a small or medium open table the height is perfect ...i need it to go inside my bird aviary. I would really appreciate your help i look forward in hearing from you. Hi, is this the tallest flat bird feeder like the one on amazon that’s 1.3m high? If not do you sell that one on your site? Hello. Live by the coast so have strong winds, seagulls,crows and jackdaws descending if food put out. Have a garden with hedge which also attracts many small garden birds. Would like a sturdy strong table to feed the smaller birds and keep off large birds. Can you give me some advice, please. Could I have the dimensions please of the £19 table feeder. Are there any problems with this open bird table regarding drainage to keep bird food from being ruined in wet weather please? I imagine that seeds etc. could become messy if sat in water. How easy is it to clean the table - is one of the sides removable for easy cleaning? There are gaps in the table on each of the four corners where the water can drain from. The sides are not removeable. With regards to cleaning we usually just recommend using a brush to quickly push away any debris. Also every so often clean with some warm soapy water. It is adviseable to not put lots of food out until you are attracting.